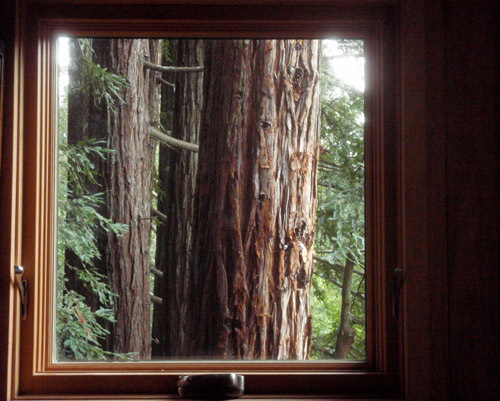 I’m very grateful to Kirsten Dirksen for making such an elegant little documentary about my House of Tree project, which she recently posted on her website, faircompanies.com. When she contacted me over the winter holidays about wanting to interview me about Deep Craft, wowhaus and House of Tree, I had not visited her website or seen any of her work, so I was surprised and delighted to learn that her focus is on small scale, portable and alternative architecture. I spent a lively day in early January hanging out with Kirsten and her husband, Nicolas as they peppered me with insightful questions and shot stills and video. The House of Tree piece was filmed at the end of the day as the sun was setting, after we had toured our studio compound. I’ll be anxious to see the video Kirsten posts about her visit to wowhaus headquarters. To see the video and read Kirsten’s excellent commentary on faircompanies.com, please click here. 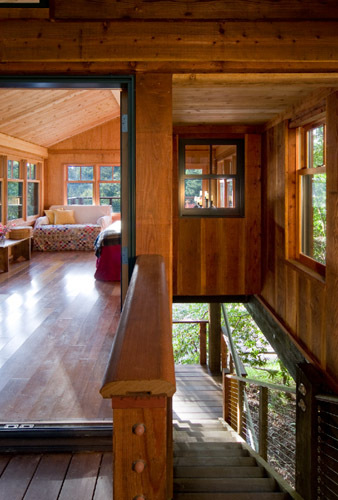 I’ve always loved designing and building cabins, and was thrilled to have two simultaneous commissions over the past year and a half, both of which are recently completed. I’d like to design more of these simple, hand-built houses and intend to promote these recent projects, so we hired the architectural photographer Tim Maloney to document them. Tim shot each project in a single day, working closely with Ene, who staged the interiors. 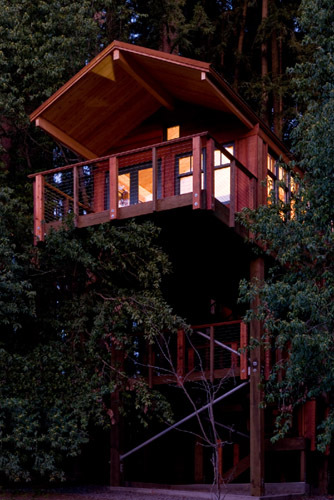 I’ve posted my favorite images from each project below, beginning with House of Tree, a tree house/observation tower that I designed for a client in West Sonoma County, built by Tom Holland and Richard Ernst. 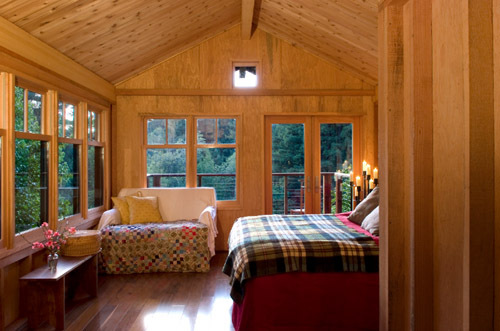 The second is a Guest House in Marin County, designed by Dotter/Solfjeld Architects, for which I was commissioned to design and build the interior, including all built-in furnishings and fixtures. All images are by Tim Maloney of Santa Rosa-based Technical Imagery. You may learn more about the development of these projects by clicking on the links above. 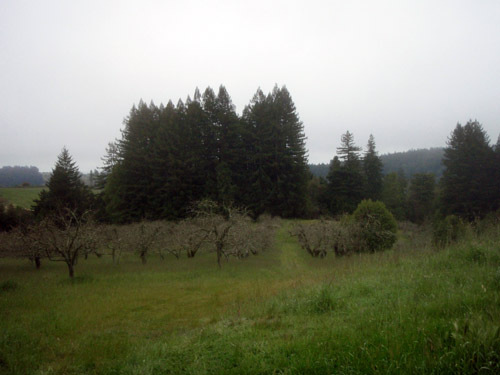 Ene and I stopped by the site of my House of Tree Project on our way to Occidental’s farmer’s market. Richard and Tom had left for the day, but we climbed up and were excited to see the building’s exterior envelope complete- windows and doors in place, cortens steel roof installed, and rough cut siding nailed up. 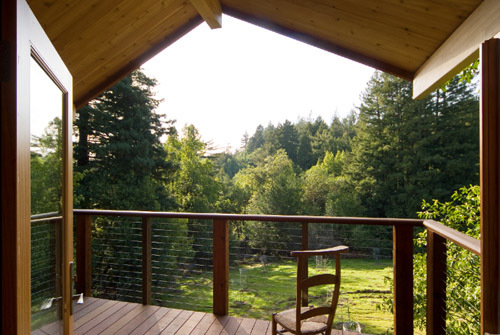 I was happy to see the quality of wood comprising the siding, tight-grained heartwood, over an inch thick, milled on site from redwood trees felled to build the structure. 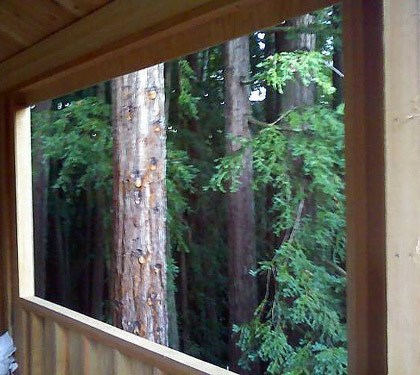 Richard and I decided to combine vertical, over-sized battens for straight runs, and 10″ wide horizontal clapboards above and below windows, to exaggerate the building’s framing. Next week the guys will focus on building the staircase, which will wind up below the house, making two landings on the way up before finally landing on the back deck. My client returns next week and I’m sure he’s going to be thrilled. 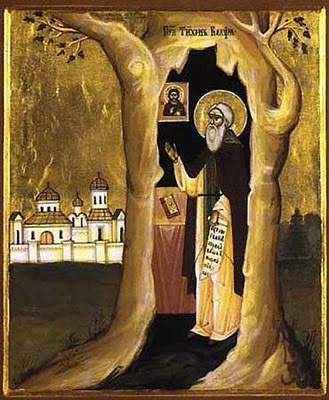 To follow the development of my House of Tree Project, click here and scroll down. 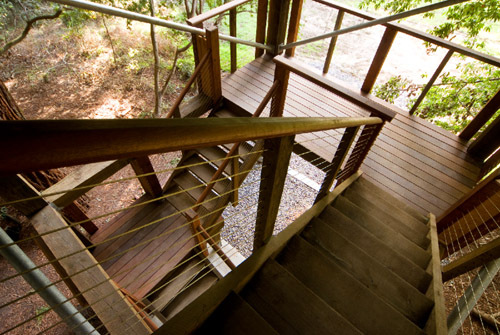 Though not technically a ‘tree house’ because it makes no connection to any tree, the elevated cabin I designed for a local client has all of the hallmarks of one: 360 degree views through the trees, rustic accommodations, no utilities, and a feeling of being apart from everything but closer to nature. The structure is fully permitted, utilizing an innovative system of helical anchors and tension/compression diagonal bracing. I called it a ‘Free-Standing Observation Tower’ on the plans, but my client has taken to calling it the more poetic ‘House of Tree’. It’s been very exciting watching the structure take shape as it nears completion under the capable hands of Tom Holland and Richard Ernst. By the end of October, we should have windows and doors installed, a roof in place, siding from redwood milled on the property, and all stairs, landings and rails in place. My client is eager to furnish the interior before the rains begin. To read more about the development of ‘House of Tree’, please click here and scroll down. 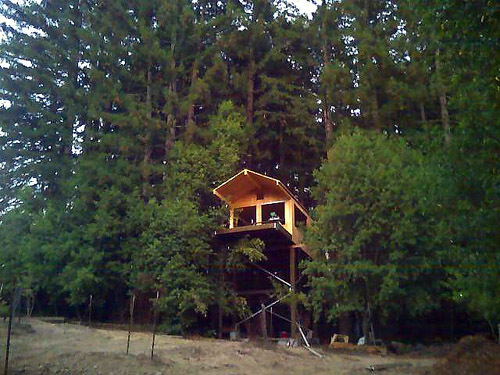 I still think of the new cabin I’m designing as a treehouse, even though it will be more of a house on stilts nestled in a fairly dense, second growth redwood grove, making no attachment to any tree. 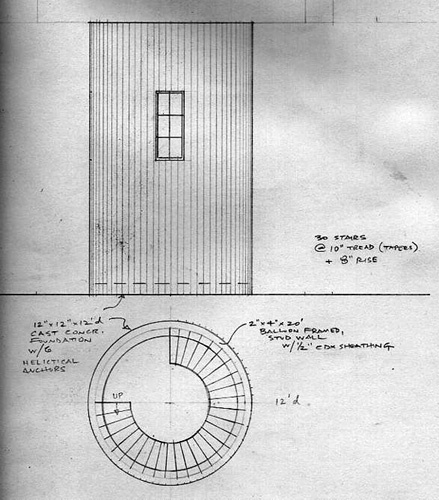 My original idea was to camouflage the structure by making the stair tower resemble an old growth trunk, consisting of coopered redwood timbers housing a spiral stair (see above drawing). 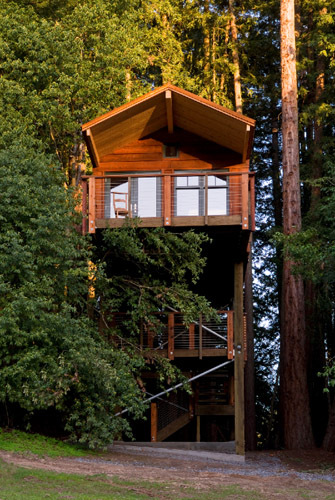 For practical and economic reasons, we’ve opted instead for an open, timber framed stair tower, more like a fire watch, with more emphasis on the the interior experience of the perched cabin itself. 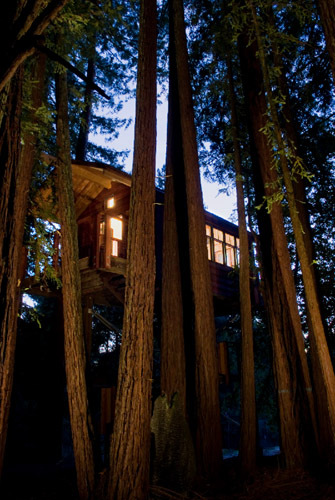 Structurally, the new treehouse I’ve been commissioned to design will be a radical departure from the various tree-sited structures I’ve made over the years, but the spirit of arboreal living will remain in tact. 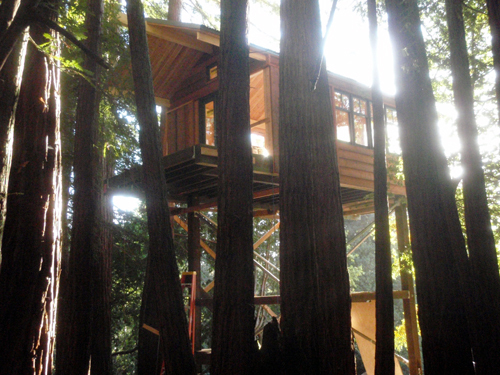 Sited at the edge of a dense, second growth redwood grove, this treehouse will be more like a watch tower, aloft in the trees without making direct connection to any tree. 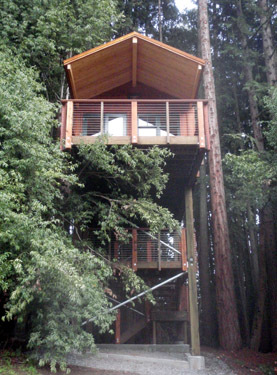 Consisting of a rustic cabin perched atop a winding stair tower, the new treehouse will have more in common with regionally familiar water towers and silos, for which the foundational connection to the ground is most critical. 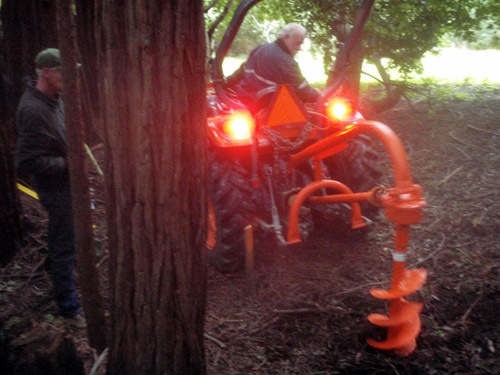 After laying out the structure’s footprint in a clearing between clusters of coast redwood, our first step has been to take soil samples, which will be analyzed by a soils engineer to specify the appropriate footings for minimal impact to the root system.